The United States and South Korea have launched their biggest-ever joint air force exercise. About 12,000 U.S. military personnel are participating along with South Korean troops. The joint exercise involves hundreds of aircrafts, including two dozen stealth jets. The annual drill will run until Friday. The drill will include the largest number of 5th generation fighters to take part in the exercises. Aircraft will be flown from eight U.S. and South Korean military installations to take part. 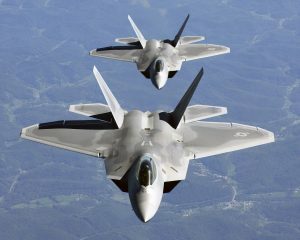 According to reports, the U.S. 7th Air Force deployed six F-22 and 18 F-35 stealth fighter jets for the exercise. The five-day drill, called Vigilant Ace, is meant as a show of military force and capabilities in the Korean Peninsula. The joint exercise is also meant to ensure peace and security in the area. The exercises have been condemned as a provocation by the North Korean government. According to North Korean state media, North Korea’s Committee for the Peaceful Reunification of the Country said the drill would “push the already acute situation on the Korean peninsula to the brink of nuclear war.” North Korea regularly uses its state media to threaten the United States and its allies. The North Korean weapons program has raised global tensions. North Korean leader Kim Jong Un has improved his country’s capabilities with every missile launch or nuclear test. The tests have been conducted in defiance of international sanctions and condemnation. Last week, North Korea test-launched its most powerful intercontinental ballistic missile yet. That missile puts most of the U.S. within range. Technical analysis of the missile’s flight showed it broke up as it re-entered Earth’s atmosphere. Senator Lindsey Graham, a Republican who sits on the Senate Armed Services Committee, said this weekend that it is time for U.S. military families in South Korea to leave the country. Graham also said he will urge the Pentagon not to send any military dependents to South Korea.